Formed by Cesar Banana Pueyrredon (b. in Buenos Aires, 1952), BANANA play a somewhat typical symphonic prog with a strong emphasis on guitar and vocals. The youngest of eight children, Cesar's rather timid disposition prompted him to take refuge in piano playing. He took lessons, attended the Catholic University (Argentina) and got together with brothers and friends for a few jams. Eventually, they decided to take on the name BANANA and in 1979, they released an album which boasted honourable sales in South America (Uruguay, Chile, Paraguay, Costa Rica, Guatemala and Panama). 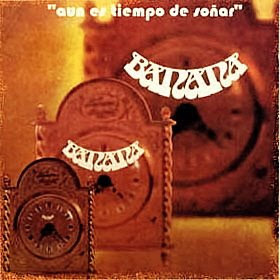 Their album, entitled "Aun Es Tiempo De Sonar", is at times very good, at times quite average prog. The music shows a variety of influences ranging from YES to NEKTAR, FOCUS, KAIPA, GENESIS and CAMEL. Though their sound is very melodic and the guitar most prominent, the rhythm section is pretty basic and the keyboards (mostly Fender Rhodes) are usually relegated to the background. As for the vocals, they are fairly abundant but sound rather AORish, or crooner style, if you like. What this album lacks is perhaps a little Latin flair - something similar to what their fellow countrymen ESPIRITU do. This definitely would give their material a bit more punch and originality. Certainly not essential but has its fine moments, if only for the few times the synths burst forth, adding a whole new dimension to their sound.